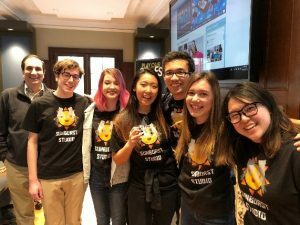 Worcester, MA – February 25, 2019 – Sliptime Sleuth by Sunburst Studio won the Grand Prize in the eighth annual MassDiGI Game Challenge pitch contest this weekend. Sliptime Sleuth, an isometric, neo-noir puzzle game where the player, a time-traveling detective, slides through time in order to uncover clues and solve a crime, was created by Sunburst Studio, a team made up of six Worcester Polytechnic Institute (WPI) students Tyler B Marcus, Mari Endo, Dylan Valev, Jasmine Duerk, Mackenzie Goldschlager and Karen Hou. The game edged entries from top independent game developers as well as other student game developer teams representing other institutions such as Northeastern University, Champlain College and Becker College. Sliptime Sleuth (gameplay video) will be released on PC next year. 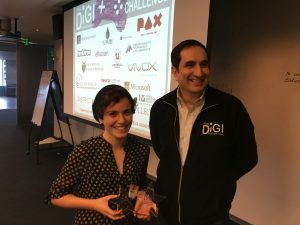 The MassDiGI Game Challenge, in its eighth year, helps indie and student game developers and entrepreneurs hone their business focus, shape their ideas and products for launch. This year 37 teams from across the New England registered to compete in front of a packed house at the Colleen C. Barrett Center for Global Innovation and Entrepreneurship on the campus of Becker College in Worcester. Other top winners included Feral Frontier (teaser video) which won the Indie Category and People’s Choice Award. The game was created by Beverly, MA-based Dirty Beast Games, a team made up of three independent game developers Josh Cheney, Felicia Santos and Ken McHugh. 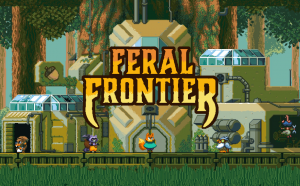 Feral Frontier is a retro side-scrolling platformer game for PC featuring an all animal cast in a world where primal nature meets advanced technology. Vibrant pixel art graphics accompany an eclectic synth soundtrack to create an environment where fast paced action, exploration and adventure await. Since the MassDiGI Game Challenge began, nearly 300 different teams from around northeast and beyond have pitched games and taken home prizes valued at over $100,000. Top past winners include titles such as Salad Hunt, Intern Astronaut (VR), PWN, Catlateral Damage, Depression Quest, Wobbles and Starlot Derby. The annual event is a showcase for the expanding game development community in the area. Over the event’s two days, dozens of game industry veterans served as judges and mentors. As the Grand Prize and a College & University Group winner, the Sunburst Studio team won cash and other prizes valued at about $5,000. The other College & University Group winners were Basic Witch from Becker with Project Birchtree, a mobile game about a laid-back, enchanted latte-throwing barista witch trying to save her town from being overrun by demons. FPS from Northeastern with Fruit Postal Service, is a battle racing game for PC where you play as a member of the FPS and try to pick up and drop off the most packages to become the employee of the month. And, Team Disco*Vision from Champlain with Blood to Ink, a narrative-based murder mystery game for tablet. CrypticCHAD, a team of Nashua (NH) North students, won the High School Category with Soul Mates, a dating simulator mixed with a role-playing game. The complete results are posted here. The Massachusetts Digital Games Institute (MassDiGI) is the statewide center for academic cooperation, entrepreneurship and economic development across the Commonwealth’s games ecosystem. Established in 2011 and based in Worcester at Becker College, MassDiGI has launched several initiatives that support entrepreneurship and strengthen the talent pipeline between higher education and the game industry. Well-known initiatives include the Summer Innovation Program LiveStudio and the Game Challenge – all of which bring students and professionals together to work on real projects. For more information, please visit www.massdigi.org. Post also on Gamasutra here. This past Saturday MassDiGI hosted our first-ever Pre Game Challenge. The event, held on campus at Becker College’s Colleen C. Barrett Center, featured a full house on hand to listen, learn and pitch. The crowd, made up primarily of college and university students, including those from institutions such as Becker, WPI and Baruch among others, were in the room to hear from game industry veterans Jeff Goodsill (Dailybreak CP), Rich Gallup (Otherside Entertainment) and Oleg Brodskiy (BostonFIG Fest) about what goes into a great game pitch. After hearing some excellent advice and getting some tips, tricks and insight into the elements of a pitch, a dozen teams signed up to take part in the inaugural PGC Minute To Pitch It Contest. The contest, judged by Jeff, Rich and Oleg, featured a lot of well-constructed pitches from many talented, budding game entrepreneurs and in the end the judges chose Sliptime Sleuths by Sunburst Studio, a team from WPI, as the first place winner. In second place was another team from WPI, Gungus, Wungus & Jimmy with Cryptid College. Third place went a team from Becker with Prototype Arrow. An honorable mentioned was awarded to WPI’s Kobi D. with Bloody Mary’s. The Pre Game Challenge was designed to give attendees a chance to hear from experts and practice pitching well in advance of our annual late winter/early spring Game Challenge. And, to that extent, the event was a great success – we can’t wait to see what’s next! Worcester, MA – March 6, 2018 – Fur by Grind Games won the Grand Prize in the seventh annual MassDiGI Game Challenge pitch contest this weekend. 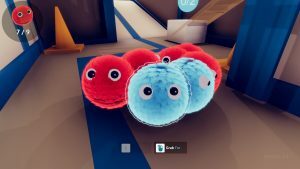 Fur, a first person puzzler, where players save cute furballs then nurture and use them to explore and solve problems was created by Grind Games, a team made up of three Becker College students, Tung Vu, Matt Venezia and Jared Braun. The game, which also won the College & University Beta Category, Best Business Model and Best Audio at the contest, edged entries from student teams representing other institutions such as Champlain College, WPI, Quinsigamond Community College, Northeastern University and Harvard University. Fur will be released on PC later this year. The MassDiGI Game Challenge helps indie and student game developers and entrepreneurs shape their ideas and products for launch. This year 31 teams from across the northeast competed in front of a packed house at the new $7.3 million Colleen C. Barrett Center for Global Innovation and Entrepreneurship on the campus of Becker College in Worcester. Since the MassDiGI Game Challenge began seven years ago, over 250 different teams from around New England and beyond have pitched games and taken home prizes valued at over $100,000. Top past winners include titles such as Salad Hunt, Intern Astronaut (VR), PWN, Catlateral Damage, Depression Quest, Wobbles and Starlot Derby. The annual event is a showcase for the expanding game development cluster in the region. Over the event’s two days, dozens of game industry veterans served as mentors and judges. As the Grand Prize, College & University Beta Category and Best Business Model winners, the Grind Games team won cash and other prizes valued at about $5,000. Other top winners include Burlington, VT-based Micropup from Champlain College which won the People’s Choice Award for its game Keeper as well as the Serious Category. Keeper is a 3D platformer with gardening mechanics and is focused around raising awareness for declining bee populations. 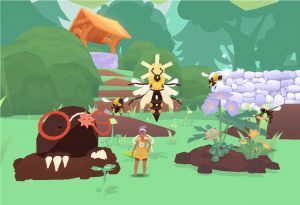 Through an engaging narrative complete with wildlife friends, the game communicates actionable, real-world tactics to aid local pollinators. Psychoactive Entertainment, another team made up of Becker College students, won the College & University Alpha Category with a game codenamed Project Boynton where you play as a punk witch and obliterate monsters, harvest their guts and use those guts to craft potions to obliterate more monsters. Garden, an augmented reality (AR) gardening app, by Sunshine Committee won the Indie Category. The Best Art award went to Fire Frame with Atlas Excel (Pratt Institute), Best Technical Dystrophic with Hexile (Harvard). Read the full press release on Gamasutra here. On October 26, 2017, the Baker-Polito Administration awarded MassDiGI a $35,000 grant toward the development of our New Ventures Center. The NVC will serve as an on-campus business assistance center for interactive media, game development, business and technology students from Becker and other higher education institutions across Massachusetts. Through active mentorship with game industry leaders and faculty experts, the NVC will bring students together and provide access to the educational programming, technical assistance, and business development support needed to learn, incubate, and launch products in the global digital marketplace. The Collaborative Workspace Program awards, a MassDevelopment initiative, seek to strengthen community-based innovation and entrepreneurship in the Commonwealth’s cities and towns, while spurring job creation at the local level. This is the second award MassDiGI has received from the program. Read more about the award in MassDevelopment’s press release here and in the Worcester Business Journal here, Patch.com here and Worcester Sun here. In a world where innovation and disruption reign, MassDIGI is a key player. That was underscored today by the Worcester Regional Chamber of Commerce when it presented MassDiGI with a Game Changer Award. The award, presented during the Chamber’s annual Game Changers Business Conference and Expo in Worcester’s Mechanics Hall, recognizes the most innovative companies, colleges and start-ups that are transforming and supporting the region’s economy. This year’s theme was the innovation economy and start-ups. MassDiGI’s Executive Director Tim Loew and Managing Director Monty Sharma were on hand to receive the award. Also present at this morning’s event was Becker president and MassDiGI advisory board chair Nancy P. Crimmin, Alan Ritacco, dean of the school Design and Technology, and students from MassDiGI’s Live Studio course. Tim Mammen of IPG Photonics and Shahbaz Soofi of WooRides also received Game Changer awards. Read more about the award in the Worcester Telegram & Gazette here. Cambridge, MA – February 27, 2017 – May’s Journey by Small Squares won the grand prize in the sixth annual MassDiGI Game Challenge pitch contest this weekend. In May’s Journey, an educational game that teaches programming through puzzle solving and storytelling, the hero, a girl named May, finds herself trapped in a broken game world. She wants to escape but in order to do so she must find her friend. There is only one way to get out; coding. May’s Journey aims to interest middle and high school aged old girls in computer science by teaching them the basics of programming through play. Representing Small Squares at the contest was Chaima Jemmali, the game’s programmer and designer. The game, which also won the Serious Category at the contest, will be released on PC later this year. Jemmali, a native of Tunisia and former Fulbright scholar, began working on the game in 2015 with her colleague Jonathan Yang as part of their interactive media and game development master’s degree program at Worcester Polytechnic Institute (WPI). Yang currently works in Shanghai, China. The MassDiGI Game Challenge helps indie, startup and student game developers and entrepreneurs shape their ideas and products for launch. This year 33 teams from across the northeast competed in front of a packed room at the Microsoft New England Research & Development Center in Kendall Square. 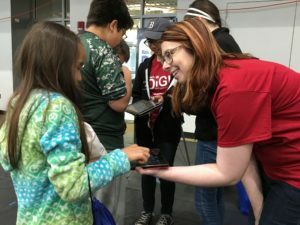 Since the MassDiGI Game Challenge began six years ago, over 200 different teams from around New England and beyond have pitched games and taken home prizes valued at over $100,000. Top past winners include titles such as Intern Astronaut, PWN, Catlateral Damage, Depression Quest, Wobbles and Starlot Derby. As the Grand Prize and Serious Game Category winners, the Small Squares team won cash and other prizes valued at about $5,000. Other top winners include Lawrence, MA-based BareHand which won the People’s Choice Award for its game Cede as well as the Indie Demo/Alpha Category, Best Technical Plan and Best Business Plan. Cede is a 3D Action-RPG combining the best experiences of Diablo and Harvest Moon with a unique new mechanic called “combat farming”. Salad Hunt, an arcade-shooter in a casual mobile setting, earned Best Art, Best Audio and was the runner-up in Indie Demo/Alpha Category. In the game, you play as a chef that is surprised to find that the salad ingredients have come alive as cute but mischievous characters that are ruining the kitchen. The other top Indie winner was Kill the Old Gods by Weeping Witch Studios which won the Beta/Near Release Category. 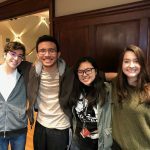 A team of Becker College and Emerson College students won the College Beta/Near Release Category with OBIO, a game in which you guide your bots through cyberspace, solve puzzles, eliminate viruses and save the internet. OBIO will be released for iOS, Android, PC and Mac in April. Bounce.wav, an arcade-style mobile game set to synthwave beats made by a team of WPI graduate students, won the College Demo/Alpha Category. Winning the High School Category was Green Ninja, a team of two students from Millbury (MA) Memorial Jr./Sr. High School. Serious: MadUnd3ad Studios from Northeastern with Monsters and Memories. Indie Beta/Near Release: Witching Hour with Connexi. College Demo/Alpha: Sound Lemmings Studio from Northeastern and Tufts University with Node and Dog Squad from Smith College and Hampshire College with Pickup Pup. College Beta/Near Release: Blue Drop Games from Northeastern with Before Common Era (B.C.E.) and Jaderain Studios from Becker with Don’t Shoot Us. Sound Lemmings Studio also earned Best Design and Balls, another game by WPI graduate students, earned Best Paper Prototype. MassDiGI is pleased to announce that we have been awarded a Collaborative Workspace Program grant from MassDevelopment to be used for core networking equipment in our New Ventures Center (NVC) at 80 William St. in Worcester. The NVC, a community-facing business assistance center for interactive media and game development students and entrepreneurs, is currently under renovation and scheduled to open in summer/fall 2017. 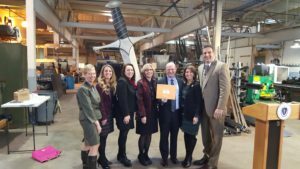 The $50,000 grant was one of 23 awarded by the Baker-Polito Administration to strengthen community-based innovation and entrepreneurship in the Commonwealth. 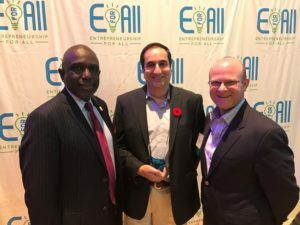 The awards will go to support the physical infrastructure to supports the growth of new entrepreneurial ventures, while spurring innovation and job creation at the local level. Read the official press release here, MassLive’s story here and WBJ’s story here. Read more about it at Gamasutra, Engadget, McGovern.House.Gov, WBJ, Worcester Sun, Telegram.com and GoLocal. 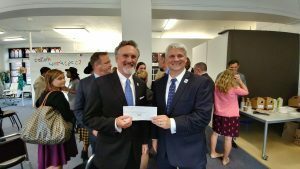 The U.S. Economic Development Administration (EDA), a bureau within the U.S. Department of Commerce, has awarded a five year, $583,000 University Center program grant to MassDiGI at Becker College to support its ongoing efforts to promote entrepreneurship, academic cooperation and economic development across the state’s video and digital games ecosystem. This is the second such grant for MassDiGI from the competitive University Center program. The first was awarded in September 2011. Established in April 2011, MassDiGI is the result of creative collaboration among academia, industry, and government, aimed at nurturing the growth of the game industry cluster in the region. MassDiGI offers a number of programs and activities which nurture collaboration among students, faculty and the public, private, and non-profit sectors. Best known among its offerings is the Summer Innovation Program (SIP). During this Worcester-based internship program students take a game from concept to market in 12 weeks. More than 700 students from dozens of institutions around the world have applied since SIP began in 2012. Of those applicants over 100 students have participated from schools such as MIT, Tufts, Carnegie Mellon, Worcester Polytechnic Institute, University of Southern California, Rhode Island School of Design, Northeastern University, Letterkenny Institute of Technology in Ireland, Smith College, Berklee School of Music, New York University, and Becker College. SIP alumni have gone on to work at a range of companies including Harmonix, Microsoft, MIT Lincoln Laboratory, Amazon, Warner Bros., 2K, Disruptor Beam, Uber, Nickelodeon, Sony, Facebook, and Hasbro or startup their own studios such as Zephyr Workshop, Starcap Games, and Petricore Games. Among MassDiGI’s other programs are its Game Challenge pitch competition for aspiring game developers held every year in Cambridge, Mass., Live Studio cross-registration courses at Becker and Mentoring on Demand advisory services for entrepreneurs and non-profits. Meloni is also the editor in chief of Gaming Business Review and executive director of the Open Gaming Alliance. With its experienced staff and a cadre of veteran game development mentors, MassDiGI works to help strengthen the area’s games sector, advising on everything from strategy and marketing, to financing and hiring. “Starting up a game studio as a novice entrepreneur right out of college is a risky proposition. There’s no question we wouldn’t be where we are today without the continuing advice and guidance we get from MassDiGI,” said Petricore Games Co-founder and CEO Ryan Canuel. Canuel is also the 2016 Worcester Regional Chamber of Commerce Entrepreneur of the Year and a Becker College ’15 and MassDiGI SIP ’14 alumnus. More information about MassDiGI can be found at massdigi.org or by following @mass_digi on Twitter. “Whether it’s the Starship Enterprise or the Millennium Falcon, many of us have long dreamt of piloting a spaceship. Now, thanks to a team of college students, that dream can now become a reality — or more like a virtual reality nightmare. Read the full story here in the Boston Globe.